Jignasha Panchal, a final year MEng (Civil Engineering) student has won the Ground Engineering Next Generation Undergraduate of the Year Award 2014. On 13th November 2014, final year MEng (Civil Engineering) student, Jignasha Panchal, was in the spotlight at a special awards ceremony. She was among the ten winners and over 120 leaders from the geotechnical and ground engineering industry at the 2014 Ground Engineering (GE) Next Generation Awards, which took place at the Grange Street St Paul's Hotel. Jignasha came away with the Undergraduate of the Year Award. The event celebrated the most talented young engineers in geotechnics, recognizing future leaders and top performers across academia, apprenticeships, ground investigation, geoenvironmental engineering and the geotechnical engineering business. 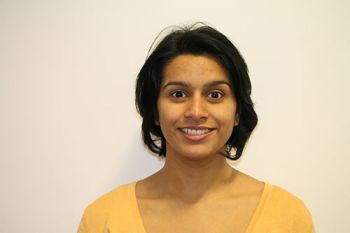 "We are all immensely proud of Jignasha's achievement, but not surprised, as she combines a very mature attitude to her studies, with a real talent for geotechnical engineering." Geotechnical engineering is the field of study concerned with applying a knowledge of the mechanical behaviour of soil to the design of civil engineering structures in the ground. For her third year course project, Jignasha researched and analysed safe ground engineering practices. Drawing on work she prepared for the project, her lecturers, Professor Stallebrass and Dr Andrew McNamara, asked her to consider applying to enter the Undergraduate of the Year award category of the GE Awards. "I have discovered that civil engineering revolves around concepts of mathematics and design and can benefit society by providing fundamental services and infrastructure. London is a great hub of construction activity which is inspirational and fascinating. I now have an understanding of the stages involved in turning a client's idea into a physical structure on the ground." "Studying engineering has given me the opportunity to pick up technical knowledge and interpersonal skills that are not easily taught, such as communication, leadership and team work. As with any degree, civil engineering has been extremely challenging. However, I have been taught the theoretical concepts in lectures and I have used them in lab work and in the design of structures. I highly recommend City to prospective engineering students". "Design projects set up by Arup, for instance, have made my study programme invaluable, as I was able to complete concept and detailed designs of an engineering problem and then present them back to the client. This provided me with the confidence to stand in front of a group of professionals and communicate my ideas." "Applying my research and theoretical knowledge to large scale complex ground engineering problems would be a major achievement." Please visit this website for more information about City's MEng (Civil Engineering) programme.